This article first appeared in The Edge Financial Daily, on December 14, 2016. KUALA LUMPUR: In less than four months, Malaysia’s equity market has been downgraded twice by Nomura as the global investment bank expects the country’s worsening growth outlook to continue in 2017. “We downgraded the market to neutral in September and now [the] further downgrade to underweight reflects a worsening of its growth outlook,” Nomura vice president of equity strategy for Asean and Asia ex-Japan Shubhankar (Mixo) Das said in a media briefing on Nomura Securities’ equities and economic outlook 2017 on Monday. 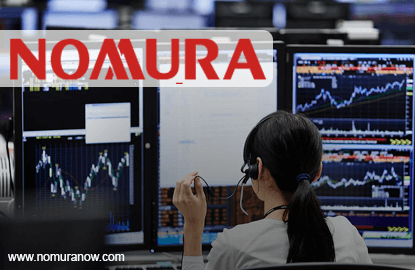 Mixo shared the same view with Nomura economist Euben Paracuelles that many of the country’s supporters of growth are starting to fail, which translates into a weaker earnings profile for the equity market. The Edge Financial Daily reported yesterday that Paracuelles cut Malaysia’s gross domestic product growth forecast for next year to 3.7% from 3.9%. Similarly, he expected the country’s 2018 improvement to be limited, and thus projected a growth of 3.7% as compared with the previous 4.2%. According to Mixo, earnings in specific sectors in Malaysia are also facing sector-specific downside pressures, especially banks, as net interest margin is compressed with the likelihood of Bank Negara Malaysia (BNM) cutting rates further. “Consumer and properties are also seeing pressure while the palm oil price seems to [have] peaked at this point and is not expected to go any higher. Despite the weak earnings profile, the market is actually not very cheap. It’s in fact the third most expensive in Asia, after Thailand and China. This does not place [Malaysia] very well in terms of risk-reward,” he added. Malaysia may see a greater slowdown in the manufacturing sector too, which could potentially “spill over” into the private sector. This, according to Paracuelles, who also shared his views via teleconferencing at the same briefing on Monday, would worsen if the US retreats from the Trans-Pacific Partnership trade deal, which would impact its major trading partners including Malaysia. Nomura foresees the ringgit weakening further to potentially as low as 4.52 against the US dollar by end-2016 and 4.76 by end-2017. The local note, it said, will be dragged not only by its position as one of the “underperformers” among other currencies, but also the “political noise” leading up to the upcoming general election (GE14). While the ringgit’s forecast level is one not seen since 1998, Mixo and Paracuelles are of the view that the current environment is different from the Asian Financial Crisis, citing ongoing fiscal reform, well-capitalised banks and a diversified investment in foreign assets. Mixo also noted that while the Malaysian market is not cheap, the equity market is trading at a forward price-earnings ratio (P/E) of about 15 to 16 — not as excessive as just before the crisis, when the market was trading at a P/E of about 20.